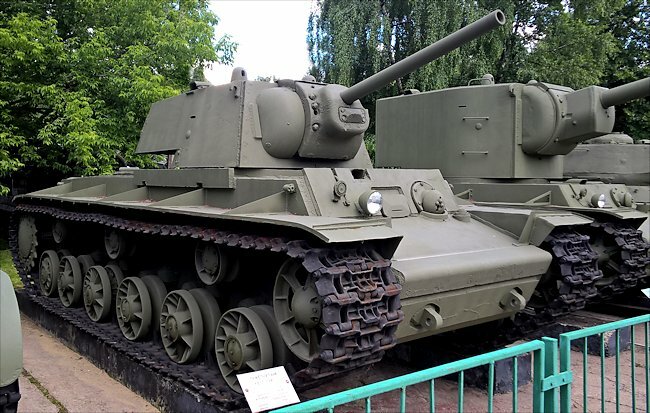 On 23 June 1941 a new Soviet KV-1 Heavy Tank had taken up position in a defile between marsh and forest blocking the center line of the advancing 6th Panzer Division. For two days it stayed there, its 76 mm gun first destroying 12 lorries and then at 600m two of the latest 50 mm anti-tank guns sent to deal with it. It proceeded to knock out an 88 mm gun at 900m before the German gun could fire a shot. Unlike a tank large Anti-tank guns like the 88mm need time to set up before they can fire. It also easily deflected shots from some Panzer III's 50 mm guns. It's armour was finally penetrated by a second 88 mm anti-tank gun which got into position at 800m away while the Russian KV-1 tank crew was distracted by some Panzer II tanks and advancing infantry. When the Germans later examined the armour of this new Russian monster tank they were shocked to find that their 50 mm gun armour piercing rounds had barely dented the KV's armor and that only two out of seven 88 mm shots that hit the tank had penetrated its armour but still without terminal results. Explosives dropped into the turret by Panzergrenadiers finally finished the job. After meeting the KV-1 and T34/76 tanks in battle signals of alarm were sent to Berlin from the eastern front, insisting that the existing German tanks must at once be powerfully up-gunned and up-armored. 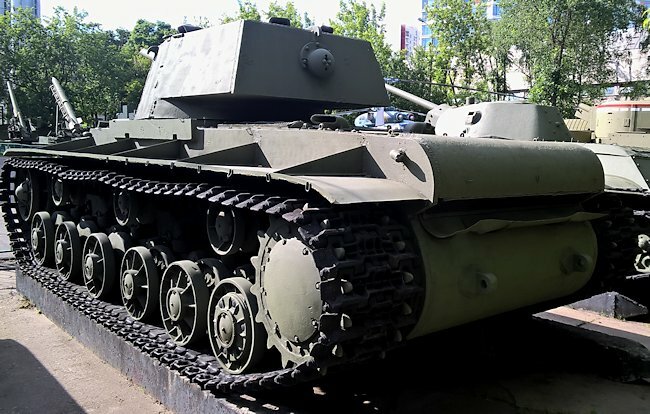 Strong recommendations were also sent that the next generation of medium and heavy tanks, currently in project model stage, should be further improved using increased sloping armour and put into production as quickly as possible. As a stop-gap measure the German tank designers put captured and German anti-tank guns onto tank chassis. The Marder and StuG range of Assault Guns were rushed into production to meet the menace of the Soviet KV-1 and T34/76 tanks whilst the advanced Panther and King Tiger tanks were being designed and tested. Whilst the German Army units were waiting for these new assault guns to be rushed to the front they had to deal with these Russian KV-1 tanks by changing their tactics in the field. They started to deploy the 88mm anti-aircraft guns in an anti-tank role along with the normally indirect artillery support 105mm howitzers (sometimes called the 100mm gun) in a direct fire role against enemy tanks. 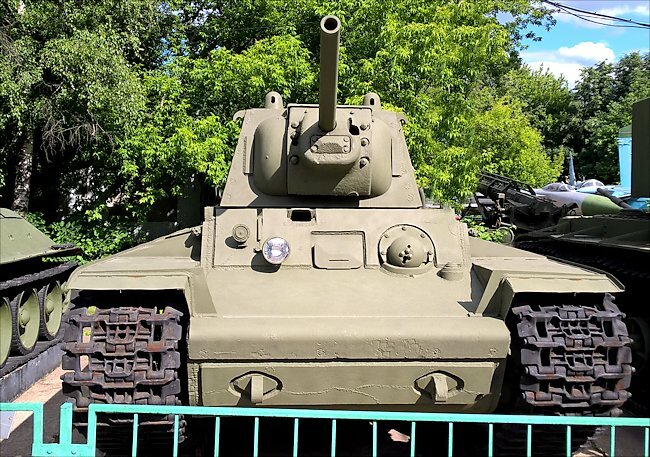 Even the mighty KV-1's frontal armour could not withstand a a 31-pound shot fired at less than 1000m when it struck at 835 m/sec (2740 ft/sec). Yet neither of these guns, the 88mm AA or the 105mm Artilery gun provided a satisfactory answer to the new Russian tank threat. These German guns were heavy and bulky, they were slow to deploy, difficult to conceal. Thye suffered from deficient crew protection against hostile enemy high explosive HE fire. The tanks of Russian General Katukov's 4th Tank Brigade had been concealed positions among the woods fronting the village of Woin, they were content to allow the Germans to advance beyond the crest before opening heavy and accurate 76 mm tank fire. Having measured the range at leisure, they at once scored hits and kills, easily penetrating the German armor at ranges in excess of 800m, but safe against shot from the short German 50 mm guns, which glanced off their thick and well-sloped thick armor. The unequal duel was of short duration. The German tanks retired first to hull-down positions and then back down the slope, abiding by doctrine and a technical superiority which prescribed that high-velocity field artillery could best kill tanks. But the two 88 mm guns by no means had it all their own way. 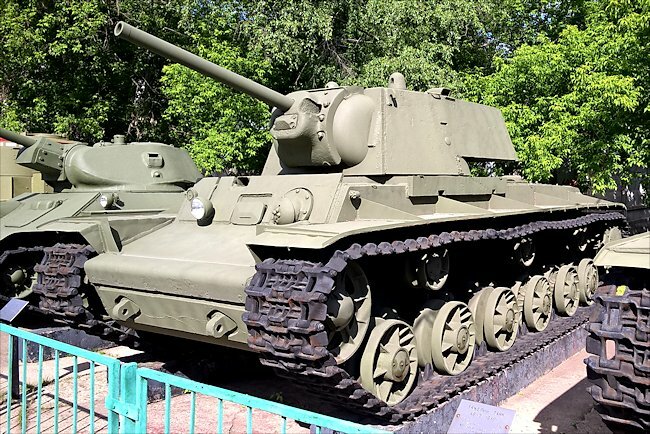 No sooner had they opened fire from the crest, and each in turn claimed a victim, than they were put out of action by high-explosive from the kV-1 tanks' guns.